Did you know Mighty-O Donuts donates boxes of goodies to Seattle Children’s Hospital for patients and their families every Wednesday? Well they do, and they rely on community volunteers to make the deliveries. I’m guessing the deliveries are normally done by car-driving volunteers (the instructions mention driving and parking lots), but both Mighty-O (member of Bicycle Benefits) and Children’s (partner of Seattle Neighborhood Greenways with their own Livable Streets page and $500K grant to soon-to-be Puget Sound Bike Share for helmet vending machines) love bikes. We’ve never biked to Children’s Hospital, but the green directional sign from the Burke-Gilman Trail is easy to spot. Unfortunately, my Bike Maps app hasn’t been finding addresses lately, but I figured I’d be able to follow signs the rest of the way there–plus it’s only 0.3 miles off the trail. Fortunately we got to make the first right turn and didn’t have to go up the hill. Or would have, had I memorized the directions. So we explored up the hill and then back down the hill before heading to the River Entrance. There were so many bikes at the racks! We arrived at 8:30ish and several bikes rolled in while we were there. It must get completely packed by 9:00. Our next doughnut delivery will probably not be on a school day. The kids weren’t so excited about having to take their complimentary deliverer donuts to go and the rush from home to doughnuts to hospital to preschool to elementary school. We don’t generally ride 14 miles first thing in the morning. With a midday meeting for me and after-school events for all of us, that made for a 31-mile day; 10 of those miles weren’t kidmiles, but all of them were rainy miles. Come to think of it, the rain didn’t start until I removed my rain jacket and Rainlegs on the way to Mighty-O so I’m directly responsible for the day’s horrid weather. If you’re interested in taking part in the Seattle Children’s Family Resource Center Mighty-O Donuts delivery, see the Mighty-O Donuts Facebook page for signup information. This time: BoltBus, Palm Tree Ride, Islabikes. We’ve just returned from another lovely trip to Portland. We’ve gone twice by Amtrak Cascades (with the old mamabike–my longtail would need to be taken apart and boxed for train travel) and now three times by BoltBus. Previous drivers have been very accommodating, having me stow my bike before everyone’s baggage, and from the sidewalk side (normally bikes are shoved in from the street side). A couple have helped with the bike lifting to speed things along. For our Friday 10:30 a.m. bus of a three-day weekend, the driver didn’t think we’d fit–he had a full bus with three bikes already on board. He checked our boarding number versus that of the other passenger with bike (and trailer) hoping to board. Our group B beat his group C so as soon as he gave me a leery OK, I removed half the baggage from one of the cargo compartments, shoved in my bike, and then stuck everything around and on top of it. And then the other guy somehow fit his bike in as well. He was headed down to a Christmas tree bonfire–and had apparently been at Burning Gardens, too, but we didn’t recognize one another’s bikes. Obviously, both our bikes are more recognizable than our faces. My initial assessment of our driver as grumpy and not bike friendly was totally wrong, by the way. The kids made him thank you cards which he cheerily accepted at the end of the trip. And we got to see him an extra time because I left a helmet on board and had to track him down at the Greyhound station where he was happily waiting for us by the door, ready to end his long day of work. On Saturday we headed to Velo Cult to meet some friends for the 10th Annual Palm Tree Ride. I collected a couple lost Canadians on the way over and brought them along. Always the ride leader :) This photo shows a monkey puzzle tree, but there were plenty of palm trees to be enjoyed–my evidence here on Flickr. We went a bit of the way up Mount Tabor for a gorgeous view of Mount Hood. Most riders took pictures of the mountain, but I opted to take pictures of the picture takers. The kids were not impressed–they’re loyal to Mount Rainier. The ride also encountered a couple friendly cats. One almost jumped in Kath’s bakfiets box while were waiting to rejoin the ride after the cargo bike detour (we had to skip an uphill walking segment with barrier). And this mean-looking tomcat left the hood of his lawn car to make friends with Brock of The Sprocket Podcast. We couldn’t have had better weather. We saw frost on a couple blocks that hadn’t seen sun all day, but otherwise it was sunny and almost warm. I thought I was getting sick later in the day, but it turns out my hot face/flushed cheeks were a slight sunburn. Sunburn in the winter! Mr. Family Ride joined us (via Amtrak Cascades) Saturday afternoon for an appointment at the Islabikes Fitting Studio. The company is based in the UK and recently opened a by-appointment-only showroom in Portland. I read about Islabikes when they first hit the states and then met Tim and saw the bikes at the Washington Women of Cyclocross Festival last summer. Sadly the kids weren’t with me that morning. My six-year old borrowed a CNOC 16 for the Fiets of Parenthood, but today was a test ride of the two 20-inch models. Note: it’s not necessary to visit the Fitting Studio to test ride–the size chart is very accurate and Tim is happy to help via email or phone. And if you go in, don’t show up in snow boots. My four-year old (above) test rode in shoes with inordinately high soles. It was just our luck that the company founder, Isla Rowntree, was visiting town for a week. Always nice to be able to shout “I LOVE YOUR BIKES!” at the person responsible. But home in Seattle we were met with the familiar sight of a taxi (sometimes delivery truck or regular car) parked halfway in the bike lane and halfway on the sidewalk next to the J.P. Patches and Fab statue. Sigh. Of course Portland isn’t without its [very few] faults. You may have noticed the yellow van parked in the bike lanes two photos up. The driver pulled over right before I took my picture. By the time I got alongside, he was walking around to the front of the van, presumably to pop the hood. And I couldn’t figure out which lane I should use for heading to the BoltBus stop. I know there’s no sidewalk bicycling downtown, but that’s all I know about downtown Portland. The lack of the word “ONLY” made me think I was welcome in the middle lane so I rode six blocks between the rails (aw, just like Westlake at home…not that familiar means good). The left lane was a bit backed up with cars and it didn’t seem very Portland-like to have to be stuck in that. so now I know the error of my ways. SW 6th Ave is part of the Portland Transit Mall and I should have been in the left lane and should not have turned right over the rails. Oops. Ideally, I would have gone a bit out of my way and just avoided the Transit Mall. Something to try out next visit! Miss you already, Portland. I get a little jealous come Christmastime when I see all the pictures of my friends carrying their Christmas trees on their bikes year after year. I’m not the Christmas celebrator in our family so I buy the Chanukah candles by bike (doesn’t pack nearly the same punch as a big tree) and the kids and Mr. Family Ride drive to a tree farm (usually I go along) for the full experience. Obviously, we need to get Mr. Family Ride a cargo bike, too, so we can join in the bikey tradition. But happily, I carried our tree on my bike for the first time last night! …it was to carry it to a bonfire and burn it to a crisp so read into that what you will. To make up for the fact that I was “cheating” by using a cargo bike, I met my friend, Claudia, at work and carried her tree, too. I was wide, but two six-foot-long trees were an easy load. Of course it’s not the full family biking experience when I carry things without the kids on board so tree + kids is still on my to-do list. They all politely declined, as expected. There were trees laying across front baskets and front racks, sticking out of backpacks or strapped upon them, in panniers, and in trailers. Note: one was not required to come with tree–there were plenty of people just along for the ride. We biked from Westlake Park to Peddler Brewing Company where Haley and David had been collecting trees in a truck for those unable to transport them by bike. We also collected more riders there and brought our number to about 100. At the beach, Joby donned his full fire suit (he biked over with just the jacket on which was pretty cool on its own) and fed tree after tree into the flames. I hope to see the pictures the drones (I think privately owned, not SPD) took from above. And Josh Trujillo joined us at all three locations to capture some great pictures for the Seattle pi: Christmas trees turned into inferno. We were very lucky with the weather. The drizzle let up just before the ride, though it was a bit windy. However, there were sufficient incendiaries on hand that the bonfire would have been a success no matter the conditions. I have more dark and blurry pictures here. Sunday’s Kidical Mass ride took us to Ballard for our first look at the new two-way bikeway for part of the Burke-Gilman Trail Missing Link. The paint isn’t down yet and I hope they’ll put more dividers in to make things clearer, but most of the signs are up. We only took it in the westerly direction, but I don’t think it’s marked yet from the other direction because we only saw bikes coming towards us on the car half (which is fine and in fact it’s still marked with sharrows…though those will probably be sandblasted off at some point). Click my photo below for a larger version. Bikes approach from the Burke-Gilman Trail, next to a sidewalk, off frame to the left. I hope diagonal paint will make it easy to access the bikeway entrance. 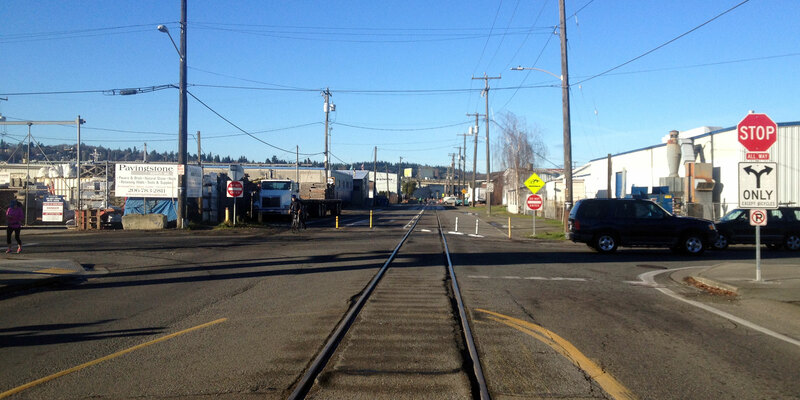 Here’s the new all-way stop as The Missing Link crosses 14th. I don’t come through here at commute time so I’ve never seen it busy. More cones. I don’t know if there are plans to paint the whole bike half green, but I hope so. The end of the bikeway is where I’d prefer to see stop signs. Shilshole is not easy to turn left onto. As for entering the bikeway from the other direction, slowing down to make the right turn in front of fast-moving cars probably won’t be very pleasant, either. I’m curious to see the finished product, but I don’t think any traffic calming is planned for this intersection. 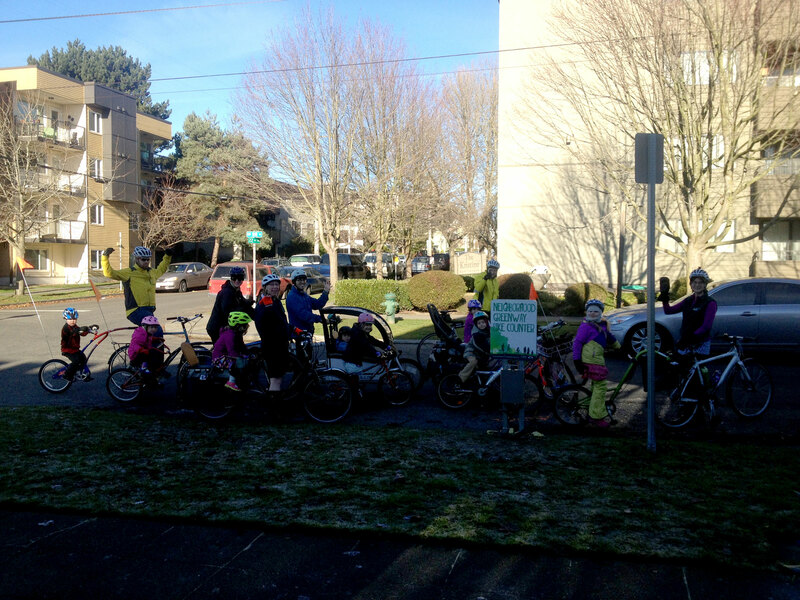 But onto better things: Kidical Mass! We met up at Ballard Library and biked a block to the NW 58th Street Greenway and got a look at the new bike counter. This one doesn’t display a number like the Fremont Bridge bike counter, but numbers should be available online from SDOT next month. The two black tubes running across the street record bikes passing by. We rode six blocks along the Greenway. It’s mostly flat, but the couple mild hills were a bit much for my four-year old on his 16-inch bike. 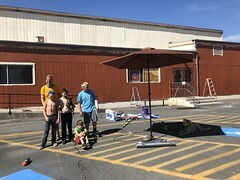 The other four kid riders were on 20-inch bikes and did OK.
We took the bike lane of busy 8th Avenue NW to cross Market with a light, but soon we were back to quiet streets and arrived at Gilman Playground. We left most of the crowd at the playground (as well as our two kid bikes) and four of us popped down to Top Pot Doughnuts for sugary snacks. Two families caught up to the ride at the playground, bringing our grand total to 24! Then it was just one block through the park and one very torn up block (due to heavy weekday truck traffic, but the kids found dodging the ruts and potholes very exciting and everyone stayed upright) to our final destination. Reuben’s Brews! Which needs more than just the one staple bike rack. I chose Reuben’s Brews after seeing it on the ParentMap Kid- and Bike-Friendly Breweries in Greater Seattle list. It worked great! I was a little worried when I read “cozy tasting room” on their website, but it seemed plenty spacious for us. And there were several tables on the upper loft. All the local breweries that don’t have kitchens seem to welcome outside food so the donuts kept the kids content. As did the complimentary bar pretzels. After the party broke up, we followed Julian of Totcycle to Adams Elementary school for the kids to practice biking. Sadly, my kids didn’t last too long. Their feet and fingers were getting cold and having just been cooped up at home for two weeks with the flu, they’d had their fill of excitement. But I was happy to have made our way north a bit so I could get the hill done at the beginning of our trek home, rather than the end. I’m happy we chose to take the Greenway towards Adams and then 75th up to Phinney Ridge because we bumped into two bonus family biking friends on our way. They don’t call Ballard “The Portland of Seattle” for nothing! And final fun item: check out this cool spill-proof carabiner mug from Fuel Coffee. Biologic Vacuum Flask which I liked fine, but the threads of the lid failed fairly quickly and it leaked all over the place. I think we just got a lemon, but we never replaced it. Stanley’s Vacuum Insulated Travel Tumbler was our next try which I also liked, but Mr. Family Ride didn’t like the spout. Stanley’s Mountain One Hand Vacuum Mug is what we’re currently on and we both like it. But I still want a carabiner mug, too. I hadn’t planned on writing a New Year’s Day post. I’ve spent the last ten days of 2013 horribly sick with the flu and am still on the mend. I’d have chosen to spend the day indoors, close to my tissue box, but I’m the healthier of the two adults at the moment so I braved the outside world to make a quick run to the pharmacy. It’s not flat, but it’s a short route: two quiet blocks to the Wallingford Neighborhood Greenway, eight blocks of Greenway, and one block along an arterial (i.e. busy street) to the store. I’m fortunate to live so close to the Greenway, and our Wallingford Neighborhood Greenway is the first in Seattle–we celebrated its opening in June of 2012. I love the Greenway and go out of my way (uphill!) to use it regularly, but it’s just paint and signs–no added stop signs and speed bumps like the newer Greenways enjoy. I’d like to think that motorists notice the Neighborhood Greenway sign and keep an extra watch for pedestrians and bicyclists, but all too often if people aren’t forced to slow their cars, they won’t. Case in point: today at 3:30, still light out for a bit, I’m riding along the Neighborhood Greenway and notice an SUV approaching from my right, about 100 feet (two houses) away. I’m already at the traffic circle, but I stop and wait. I probably had enough time to cross the intersection before him and I have the right of way, but in this situation I tend to assume the driver won’t see me. I’m glad I stopped because he was going a bit over the speed limit, had a cell phone to his ear, and didn’t even glance my way. I worry that our Greenway isn’t slated to be finished as it’s more exciting to unveil new projects, but I hope I’m wrong (looks like SDOT calls it “complete” so I’m not holding my breath). It’s a real treat to ride along the new Ballard and Fremont Greenways, knowing cross traffic has stop signs. So here’s to more Complete Streets in Seattle for 2014! Looks like SDOT has a Complete Streets page, too, though their description doesn’t give me the same warm and fuzzy feeling as the one above.